F1 Timing Screen as a Spreadsheet? One of the comment themes I’ve noticed around the first Challenge in the Tata F1 Connectivity Innovation Prize, a challenge to rethink what’s possible around the timing screen given only the data in the real time timing feed, is that the non-programmers don’t get to play. I don’t think that’s true – the challenge seems to be open to ideas as well as practical demonstrations, but it got me thinking about what technical ways in might be to non-programmers who wouldn’t know where to start when it came to working with the timing stream messages. The answer is surely the timing screen itself… One of the issues I still haven’t fully resolved is a proven way of getting useful information events from the timing feed – it updates the timing screen on a cell by cell basis, so we have to finesse the way we associate new laptimes or sector times with a particular driver, bearing in mind cells update one at a time, in a potentially arbitrary order, and with potentially different timestamps. So how about if we work with a “live information model” by creating a copy of an example timing screen in a spreadsheet. If we know how, we might be able to parse the real data stream to directly update the appropriate cells, but that’s largely by the by. At least we have something we can work work to start playing with the timing screen in terms of a literal reimagining of it. So what can we do if we put the data from an example timing screen into a spreadsheet? If we create a new worksheet, we can reference the cells in the “original” timing sheet and pull values over. The timing feed updates cells on a cell by cell basis, but spreadsheets are really good at rippling through changes from one or more cells which are themselves reference by one or more others. The first thing we might do is just transform the shape of the timing screen. For example, we can take the cells in a column relating to sector 1 times and put them into a row. The second thing we might do is start to think about some sums. For example, we might find the difference between each of those sector times and (for practice and qualifying sessions at least) the best sector time recorded in that session. The third thing we might do is to use a calculated value as the basis for a custom cell format that colours the cell according to the delta from the best session time. If you need example data, there’s some on the F1 site – f1.com – results for Spanish Grand Prix, 2014 and more on Ergast Developer API. PS FWIW, my entry to the competition is here: #f1datajunkie challenge 1 entry. It’s perhaps a little off-brief, but I’ve been meaning to do this sort of summary for some time, and this was a good starting point. If I get a chance, I’ll have a go a getting the parsers to work properly properly! In context of the Tata/F1 timing data competition, I’d like to be able to have a play with the data in Node-RED. A feed-based, flow/pipes like environment, Node-RED’s been on my “should play with” list for some time, and this provides a good opportunity. 3) an example of appending the result to a flat file – for example, building up a list of statements “Driver number x has moved from position M to position N” over time. Shouldn’t be that hard, right? And it would provide a good starting point for other people to be able to have a play without hassling over how to do the input/output bits? F1 Doing the Data Visualisation Competition Thing With Tata? Tata Communications are the folk who supply connectivity to F1, so this could be a good call from them. It’ll be interesting to see how much attention – and interest – it gets. The competition site can be found here: The F1 Innovation Connectivity Prize. The Formula One Management Data Screen Challenge is to propose what new and insightful information can be derived from the sample data set provided and, as a second element to the challenge, show how this insight can be delivered visually to add suspense and excitement to the audience experience. A technical manual is also provided for helping makes sense of the data files. Here are fragments from the data files – one for practice, one for qualifying and one for the race. A few things are worth mentioning about this format… Firstly, the identifier is an identifier of the message type, rather then the message: each transaction message appears instead to be uniquely identified by the messagecount. The transactions each update the value of a single cell in the display screen, setting its value and colour. The cell is identified by its row and column co-ordinates. The timestamp also appears to group messages. Secondly, within a session, several screen views are possible – essentially associated with data labelled with a particular identifier. This means the data feed is essentially powering several data structures. Thirdly, each screen display is a snapshot of a datastructure at a particular point in time. There is no single record in the datafeed that gives a view over the whole results table. In fact, there is no single message that describes the state of a single row at a particular point in time. Instead, the datastructure is built up by a continual series of updates to individual cells. Transaction elements in the feed are cell based events not row based events. It’s not obvious how we can make a row based transaction update, even, though on occasion we may be able to group updates to several columns within a row by gathering together all the messages that occur at a particular timestamp and mention a particular row. For example, look at the example of the race timing data above, for timestamp=”14:57:11.681″ and row=”3″. If we parsed each of these into separate dataframes, using the timestamp as the index, we could align the dataframes using the *pandas* DataFrame .align() method. Note: I’m not sure that the timestamps are necessarily unique across rows, though I suspect that they are likely to be so, which means it would be safer to align, or merge, on the basis of the timestamp and the row number? From inspection of the data, it looks as if it is possible for a couple of timestamps to differ slightly (by milliseconds) yet apply to the same row. I guess we would treat these as separate grouped elements? Depending on the timewidth that all changes to a row are likely to occur in, we could perhaps round times for the basis of the join? Getting sensible data structures at the timing screen level looks like it could be problematic. But to what extent are the feed elements meaningful in and of themselves? Each element in the feed actually has a couple of semantically meaningful data points associated with it, as well as the timestamp: the classification position, which corresponds to the row; and the column designator. A notebook where I start to explore some of these ideas can be found here: racedemo.ipynb. Something else I’ve started looking at is the use of MongoDB for grouping items that share the same timestamp (again, check the racedemo.ipynb notebook). If we create an ID based on the timestamp and row, we can repeatedly $set document elements against that key even if they come from separate timing feed elements. This gets us so far, but still falls short of identifying row based sets. We can perhaps get closer by grouping items associated with a particular row in time, for example, grouping elements associated with a particular row that are within half a second of each other. Again, the racedemo.ipynb notebook has the first fumblings of an attempt to work this out. One of the slides I whizzed by in my presentation at the OU Statistitcs conference on “Visualisation an Presentation in Statistics” (tweet-commentary notes/links from other presentations here and here) relates to what we might describe as the shape that data takes. 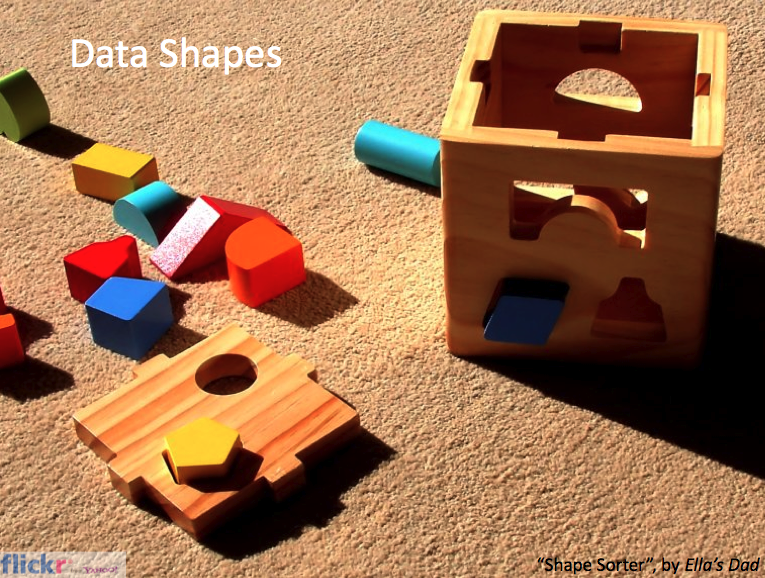 An easy way of thinking about the shape of a dataset is is to consider a simple 2D data table with columns describing the properties of an object and rows typically corresponding to individual things. Often a regular structure, each cell in the table may take on a valid value. Occasionally, some cells may be blank, in which case we can start to think of the shape of the data getting a little bit ragged. If you are working with data table, then on occasion you may want to swap the rows for columns (certain data operations require data to be organised in a particular way). By swapping the rows and columns, we change the shape of the data (for example, going from a table with N rows and M columns to one with M columns and N rows). So that’s one way of reshaping your data. Many visualisation tools require data to be in a particular shape in order for the data to be visualised appropriately. If you look at the template pages on Number Picture, a new site hosting templated visualiastions built using Processing that allow you to cut, paste and visualise data – if it is is appropriately shaped – at a click. But where do pivot tables come in? One way is to think of them as a tool for reshaping your data by providing summary reports of your original data set. What pivot tables allow you to do is generate reports based on contents of a table using the values contained within one or more columns to define the columns and rows of a summary table. That is, you can re-present (or re-shape) a table as a new table that summarises data contained in the original table in terms of a rearrangement of the cell values of the original table. Here’s a quick example. I have a data set that identifies the laptimes of drivers in an F1 race (yes, I know… again! ;-) by stint, where different stints are groups of consecutive laps separated by pit stops. So how does this work? The columns in the new table are defined according to the unique values found in the stint column of the original table. The rows in the new table are defined according to the unique values found in the car column of the original table. The cell values in the new table for a given row and column are defined as the sum of lapTime data values from rows in the original table where the car and stint values in the row correspond to the row and column values corresponding to each cell in the new table. Got that? If you’re familiar with databases, you might think of the column and row settings in the new table defining “keys” into rows on the original table. The different car/stint pairs identify different blocks of rows that are processed per block to create the contents of the pivot table. As well as summing the values from one column based on the values contained in two other columns, the pivot table can do other operations, such as counting the number of rows in the original table containing each “key” value. So for example, if we want to count the number of laps a car was out for by stint, we can do that simply by changing out pivot table Values setting. Pivot tables can take a bit of time to get your head round… I find playing with them helps… A key thing to remember is: if you want to express a dataset in terms of the unique values contained within a column, the pivot table can help you do that. In the above example, I was essentially generating the row and column values for a new table based on categorical data (driver/car number and stint number). Another example might be sales data where the same categories of item appear across multiple rows and you want to generate reports based on category. I’ve also been using the data as a foil for finding tools and applications that I can use to create data visualisations that other people might be interested in trying out too. There is a work-related rationale here too: in October, I hope to run a “MOOC”, (all you need to know…) on visual analysis as a live development/production exercise for a new short course that will hopefully be released next year, and part of that will involve the use of various third party tools and applications for the hands-on activities. One of the issues I’ve recently faced is how to plot a chart that combines tabulated data imported from a CSV file with a line graph plotted from an equation. My ideal tool would be a graphical environment that lets me import data and plot it, and then overlay a plot generated from a formula or equation of my own. Being able to apply a function to the tabulated data (for example, remove a value y = sin(x) from the tabular data would be ideal, but not essential. gnuplot> set ylabel "Fuel Weight Time Penalty"
So for example, we can plot Laptime against driver using plot ‘turlapTimeFuel.csv’ using 1:3, or Fuel Adjusted Laptime against driver using plot ‘turlapTimeFuel.csv’ using 1:4. The command plot ‘turlapTimeFuel.csv’ using 2:3 gives us a plot of each driver’s laptime against lap number. How do we read this? The command is actually of the form using x:y, but we do a bit of work to choose a valid value of x. ($1==4 ? 2:1/0):3 says “if the value of column 1 ($1) equals 4, then (?) select column 2, otherwise/else (the first “:”), forget it (1/0 is one divided by zero, a number intensely disliked by gnuplot that says in this context, do nothing more with this row…). If the value of column 1 does equal 4, then we create a valid statement using 2:3, otherwise we ignore the row and the data in columns 2 and 3. The whole statement thus just plots the data for driver 4.
plot 'turlapTimeFuel.csv' using ($1==1 ? $2:1/0):3 with lines title "(unadjusted) VET Su | Su(11) Su(25) Hn(40) Hn(47)"
plot 'turlapTimeFuel.csv' using ($1==1 ? $2:1/0):3 with lines title "(unadjusted) VET Su | Su(11) Su(25) Hn(40) Hn(47)",'turlapTimeFuel.csv' using ($1==2 ? $2:1/0):3 with lines title "WEB "
That is, plot ‘turlapTimeFuel.csv’ using ($1==1 ? $2:1/0):($3-(88+(58-$2)*2.7*0.03)) with lines says: for rows applying to driver 1 rows where the value in column 1, ($1), equals (==) the driver number (1), $1==1), use the value in column 2 ($2) as the x-value and for the y-value use the value in column 3 ($3) minus 95+(58-$2)*2.7*0.03). Note that the (58-$2) fragment subtracts the lap number (as contained in value in the column 2 ($2) cell) from the lap count to work out how many more laps worth of fuel the car is carrying in the current lap than at the end of the race. So – that’s a quick tour of gnuplot, showing how it can be used to plot CSV data and an algebraic expression on the same graph, how to filter the data plotted from the CSV file using particular values in a specified column, and how to perform a mathematical operation on the data pulled in from the CSV file before plotting it (and without changing it in the original file). To try to bring a bit of focus back to this blog, I’ve started a new blog – F1 Data Junkie: http://f1datajunkie.blogspot.com (aka http://bit.ly/F1DataJunkie) – that will act as the home for my “procedural” F1 Data postings. I’ll still post the occasional thing here – for example, reviewing the howto behind some of the novel visualisations I’m working on (such as practice/qualification session utilisation charts, and race battle maps), but charts relating to particular races, will, in the main, go onto the new blog…. Last summer, at the European Centre for Journalism round table on data driven journalism, I remember saying something along the lines of “your eyes can often do the stats for you”, the implication being that our perceptual apparatus is good at pattern detection, and can often see things in the data that most of us would miss using the very limited range of statistical tools that we are either aware of, or are comfortable using. Another shamistician (h/t @daveyp) heuristic (or maybe it’s a crapistician rule of thumb?!) might go something along the lines of: “if you use the right visualisations, you don’t necessarily need to do any statistics yourself”. In this case, the implication is that if you choose a viualisation technique that embodies or implements a statistical process in some way, the maths is done for you, and you get to see what the statistical tool has uncovered. Having an F1 data set/CSV file to hand (laptimes and fuel adjusted laptimes) from the China 2001 grand prix, I thought I’d see how easy it was to just dive in… And it was 2 minutes easy… (If you want to play along, here’s the data file). Hmm… can we set the filter value dynamically I wonder? The trick comes from choosing visual statistics approaches to analyse your data that don’t break any of the assumptions about the data that the particular statistical approach relies on in order for it to be applied in any sensible or meaningful way.